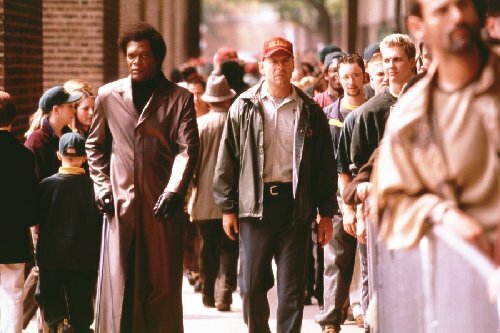 Shyamalan's idea for Unbreakable centers around the search for an answer to the purpose in life of the survivor of a horrific train crash. 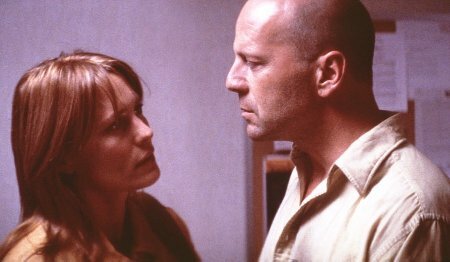 That survivor is David Dunne (Bruce Willis), a security guard at a local stadium who is completely silenced and bewildered by his survival to such a tragedy. In addition, the eternal sadness in his heart, and the crumbling of his family is slowly eating away at him. In steps Elijah Price, who could not have been played by any other than Samuel L. Jackson. Elijah first has a question for Dunne ("How many times have you been sick? "), and then an answer. "I am ready to suggest a rather unbelievable possibility," Elijah tells him. "Are you ready for the truth?" Elijah's revelation still leaves many questions, especially about his own sanity. Elijah himself is rather extraordinary, but on the unlucky side of the fence. He suffers from osteogenesis imperfecta, a condition which makes his bones extremely brittle. As a result, he turned to reading comic books as a child, a relatively safe hobby encouraged by his mother who wanted to give her son positive experiences in life. Elijah uses them to aid him in his search for an answer to why God created him with such a crippling condition. One aspect of this film that I absolutely loved was the wonder and fascination that Dunne's son, Jeremy (Spencer Treat Clark, who was Lucius in this year's Gladiator) has for his father. There is even a scene wherein Jeremy and a schoolmate argue over their fathers' might when the schoolmate says, "I bet my father could beat up yours any day." I can't tell you how many times I've heard (and probably said) that one. It was great! Jeremy's belief in his father is unwavering and is one which all young boys have felt. It was fun to see this notion repeated throughout the film. It provided for some superb scenes, including one of the most tense points of the film when young Jeremy holds his father's gun in the family kitchen. A trademark of Shyamalan's is the use of color to highlight certain points of the film. 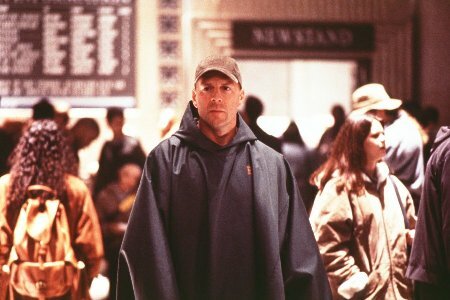 In Unbreakable, he has used two colors to represent the two main characters in the film. David Dunne is always pictured in a shade of green. Whether it be his shirt, his jacket, or the walls of his house, the color green accompanies him on screen. Conversely, Elijah Price is always accompanied by green's opposite on the color spectrum: purple. Just take a look at the buttons of his shirt in the picture above. This use of color in the film was simply fascinating and unmistakable. Below you can see both colors used. In addition you can also see another Shyamalan technique, that of using profiles. Above, Dunne talks with his estranged wife, Audrey (played by Robin Wright Penn, whom you may remember as that b!^@#, Jenny, from Forrest Gump). She does well as Dunne's wife, echoing the inexplicable sadness that David is always feeling. I also enjoyed seeing her hope and her plea to save their marriage. The story of their marriage was a common one, yet unique for Hollywood. I found it quite refreshing. Toward the end of the film, Willis' character, David Dunne evolves into a modern-day hero as he overcomes the problems in his own life, while protecting others. What is so remarkable about him is that he is a quiet hero, quite unlike that of Willis' claim to fame, John McClane of Die Hard lore. This silent type of hero is to me much more fascinating and awe-inspiring (although certainly not as fun). One thing that Unbreakable does well is to explore many questions and possibilities. The ending ties it all together, and provides another great surprise. In this respect, the ending was thoroughly rewarding. However, it seemed to be cut way too short. It uses the old Hollywood trick of finishing the story with some on-screen wording and then jumping immediately to the credits. It seems rushed, as if the film was over-budget and the ending was unable to be completed. I would have much preferred to see some of this final action, as well as some sort of scene wherein the story could be left open for a sequel. For instance, the final scene of The Silence of the Lambs shows Hannibal giving Clarice a phone call, telling her "I'm about to have an old friend for dinner." Something similar would have been perfect for this movie! Nevertheless, the movie leaves your head spinning as you leave the theater, and provides a great deal to think about and to discuss with your friends. I predict that this movie will enjoy the same sort of success that its predecessor did by word of mouth. This movie is sure to be recommended by those who have seen it, including yours truly. 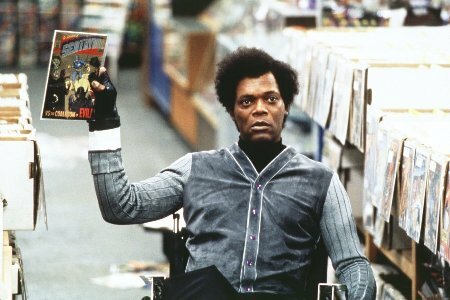 How would you rate the movie Unbreakable? There have been 49423 people to visit this page since Thu, Nov 23, 2000. And you are the first person to visit this page today!